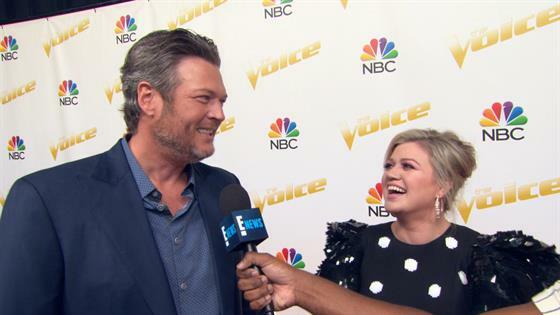 Blake Shelton Jokingly Calls Kelly Clarkson "Old as Sh*t"
Even on Kelly Clarkson's birthday, Blake Shelton can't resist a playful jab! The Voice coach put the pop star on blast in a recent interview with E! News, telling Clarkson she's well over the hill at 36-years-old. When asked to plan an ideal birthday soiree for Kelly, Blake teased, "I want to talk about some of the parties that we've had but I probably shouldn't… Kelly's old now. She's old as s--t."
"I'm 36. I love it!" Kelly fired back, also pointing out the country singer is five years older than her. That led Shelton to bring up Clarkson's position in the long line of The Voice coaches that have come before her, saying, "You're like one of those characters they add on at the very end. Maybe you'll get a spinoff!" "I'm OK with that!" Kelly teased. "There were some characters that came in at the end that were really rad and made it so popular. There are people that might consider me a light or breath of fresh air, old man!" And what are the chances that Kelly could win the entire show? For Blake's honest take, and even more hilarious back-and-forth between the pair, press play on the video above!